A talented young Stoke-on-Trent accountant has won national recognition after passing part of his taxation exams with the highest marks in the UK. Josh Draycott joined Geens Chartered Accountants after A-levels and has won the Kimmer Medal for the best paper in the Inheritance Tax, Trust and Estates section of the ATT (Association of Taxation Technicians) qualifications. Geens are celebrating a double success as Hannah Sutcliffe, who only joined the staff at the Stoke town firm in the summer, passed her Level 3 AAT,, gaining a distinction. 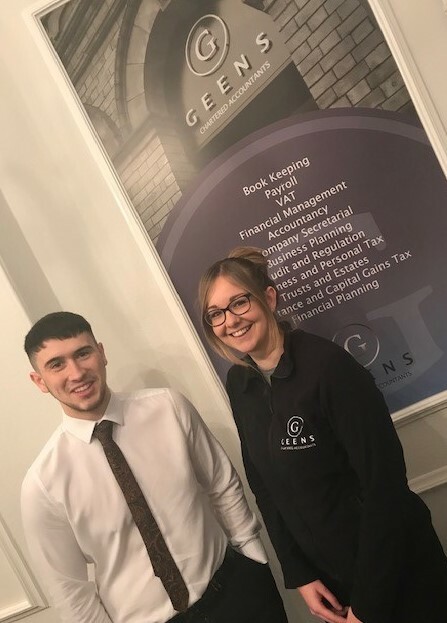 Director Karen Lowe said: “Josh is part of our Trust and Tax team and has been studying is tax exams after already passing his AAT, accountancy exams. 903 students sat the ATT exams but just 73 selected the Inheritance Tax, Trust and Estates paper due to its complexity, with only three achieving distinctions. To come out on top is a remarkable achievement for Josh. “Hannah only joined Geens in the summer from a non-accountancy role. She is making rapid progress and has now passed her Level 3 AAT with distinction. Hannah’s commitment to gaining industry qualifications is matched by her work at Geens where she has progressed very quickly. “We have a proud record of training our own staff and all five of our Directors came through their examinations at Geens, gaining promotions along the way. Geens is experiencing a period of growth, adding new clients and staff. We recently extended into Probate services, an area once reserved for the legal profession.